Muskoka chairs, Impressionist paintings of the wild, and lazy paddles on a secluded lake - some of our most Canadian images originate here in the Muskoka, Parry Sound, Amalguin Highlands, and Algonquin Park region, otherwise known as Explorers' Edge. Since the late 1800s Canadians and folks from abroad have been coming to the Muskoka region to swim, fish, explore, party, and relax amidst its swirling granite, mixed forests, and unsullied lakes. And then along came the motorcycle. The roads out here seem to have been designed for two wheels. The forests grow right up to the shoulder, and each turn might reveal a sparkling bay, a deer peeking out of the woods, or if you're lucky, maybe even a swan out in a marsh out on Milford Bay. Muskoka also offers lots to do off the bike. 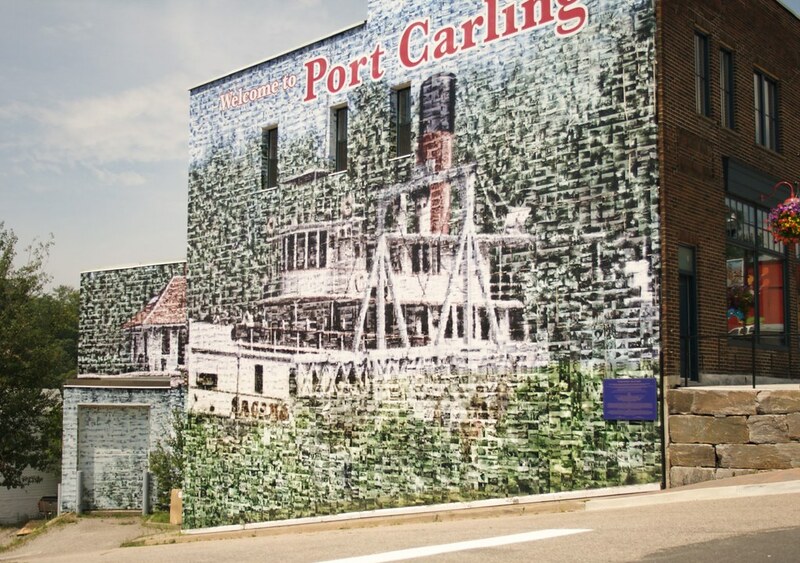 Towns like Port Carling, Bracebridge, or Huntsville boast interesting shops, galleries, cafes and pubs. And Savour Muskoka has put together a comprehensive guide to the region's best culinary treats. When out on the road during rally season, it is not uncommon to see lines of leather-jacket wearing kin leaning into a curve or rumbling over one of the old bridges on Route 169. Besides having a tonne of great roads to explore, Muskoka also has more than enough things to keep you busy off the bike. Cruises on the Wenonah II, the RMS Segwun and the rest of the Muskoka Steamships fleet are scheduled regularly throughout the summer months. Be sure to save a night to visit the unique Torrance Barrens. This park is a designated dark-sky preserve, which means artificial lights in the surrounding area are restricted for the purposes of star gazing. Lakeside rental cottages are plentiful out here, as are bed and breakfasts, hotels, and motels for shorter-term stays. Explorers' Edge provides a wide range of options for accommdations. There is really no place on earth quite like Algonquin Park. With over 7600 square km, (2950 square miles) of protected wilderness, it is one of the most frequently painted natural areas in all of Canada and has been the muse for our most internationally acclaimed artists in the Group of Seven. Most of the Park is off limits to development and is accessible only by foot or canoe. However, a series of well-planned roads twist and turn around the park's exterior, providing ample glimpses into the park's wild beauty. Along these routes, there are a handful of lodges that provide comfortable accommodations, with the Algonquin Ecolodge being particularly cool. Algonquin Park also provides a huge host of excellently maintained campsites located near some of their finest lakes and trails. For the motorcycle rider on a budget, this is definitely the way to go. Many of the park's campsites and lodges are along the Highway 60 corridor, which is the most developed area of the park. On Highway 60 you'll find excellent nature displays at the Visitor Centre, the Algonquin Park Art Centre, and a couple of general stores and restaurants. Always stop for ice cream at Lake of Two Rivers Store. Always. The rides along the park's roads are spectacular with huge hills, river crossings, and shoreline huggers, but be sure to get off the bike once and awhile. There are many short and fascinating interpretive hiking trails along these routes, all of which lead to excellent spots for picnicking. Encompassing the world's largest freshwater archipelago, Parry Sound is a convenient access point to the splendour of the 30,000 Islands region of Georgian Bay. As such, it is one of the most geologically unique towns in Ontario. Parry Sound and surrounding area take up a sizable chunk of the fabled Georgian Bay Coastal Route, a favourite among motorcycle riders in the know. Views of the Bay abound, making for some memorable sunset cruising. And the dozens of back roads shooting off into the bush will provide you with hundreds of kilometres (miles) of more technical riding. The town itself is charismatic, with much of its downtown architecture dating back to the 1920s. Here you'll find the Bobby Orr Hall of Fame, and cruises of the 30,000 islands on the Island Queen leave regularly from the harbour. The Bay Street Cafe overlooking the water is a great place to fill your belly after a long day on the road. And the Glenn Burney Lodge has long housed many a weary rider for the night. Riding out to Parry Island along the Wausaksing Swing Bridge will lead to views of the islands right from the seat of your bike. Find a patch of rocky shoreline, pack a dinner, and watch the sun go down as the waters of Georgian Bay lap at your feet. For a quintessentially Canadian wilderness experience, this is the place. Visit OntarioTravel.net's Algonquin Park, Almaguin Highlands, Muskoka and Parry Sound to start planning your trip. There's no question that Explorers' Edge is motorcycle friendly. "We've created two loops with your on-road riding experience as our top priority. We’ve taken the top roads in the region and combined them to give you two great touring options." The Short Loop is ideal for a weekend trip, at just over 650kms (400 miles) from it’s starting point. It can be done in a day, but with all of the scenic backroads, we recommend staying at least one night. If you’re travelling from the USA, or from a great distance, we really recommend making a weekend out of it. The short loop gives you a taste of each of the regions within Explorers’ Edge, without tackling the major mileage that Algonquin Park adds. It also focuses on packing more of the top roads into the loop. The Big Loop is built for high-mileage touring. Ringing in at just under 1000 km (620 miles) this route takes riders on a slightly different combination of roads and adds a ride through Ontario’s oldest and most beloved provincial park, Algonquin. Using a different set of roads, it takes riders deep into the wilds of the northern reaches of Explorers Edge.